Physics research encompasses a rich, diverse set of subfields and specialties that span length and time scales. PhysCon 2019 will bring together physics students, alumni, and distinguished guests to explore where the newest technologies meet the earliest formations, the depths of the universe meet the depths of the oceans, and where basic research meets consumer-driven product development. To bring these intersections to life, PhysCon will include scientist-guided tours of regional physics hotspots including a cutting-edge optical engineering firm, a historic observatory, a leading ocean research nonprofit, and a nuclear submarine port. If there is a downside to these tours, it’s that there will not be nearly enough time to explore all of the fascinating research happening at each site, or at the sites whose tour details are still forthcoming—Harvard University, the Massachusetts Institute of Technology, and the Rhode Island Hospital. Stay informed and register early to get your pick of tours: http://www.sigmapisigma.org/sigmapisigma/congress/2019. “I’ve touched something that’s been to space, that’s been in the human body, that makes the maps for smartphones—anything that you can think of that has a lens, and even the things that you can’t think of,” says Optikos engineer Henry Donaldson. Optikos is a private company specializing in optical engineering and metrology. That might sound like a niche market, but precision optics is an enabling technology for everything from self-driving cars to medical diagnostics and virtual reality headsets, and precision optics requires precise measurement capabilities. The company works with commercial, industrial, and government clients on projects that include not only measurement systems, but also prototype development, design for manufacturing and sub-assembly production. Donaldson works in IQ LabTM Services, a group that measures the quality and characteristics of optical systems for clients. “I see something new every day, the newest of the new,” he says. Many systems are so novel and unusual that IQ Lab engineers have to design and build custom measurement tools for these devices. Their clients come from all industries and all over the world. 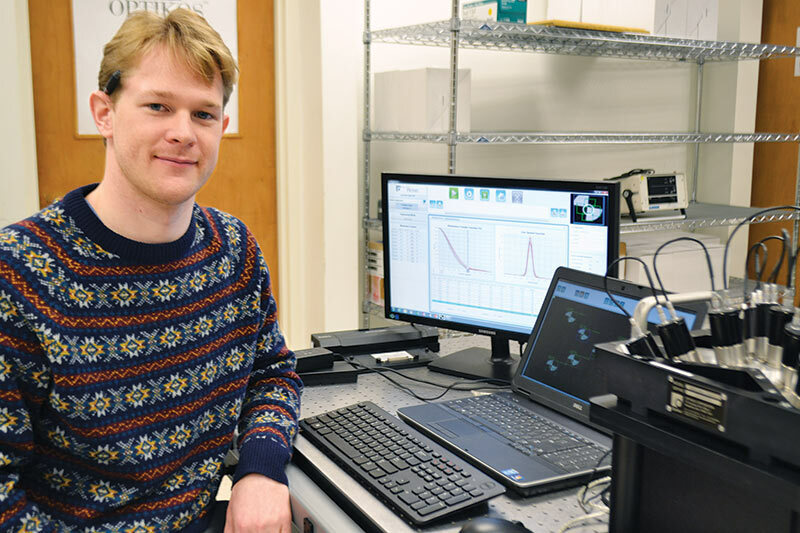 In the two years since he earned a physics bachelor’s degree and joined Optikos, Donaldson has installed sophisticated metrology systems in Spain, China, and Hong Kong. After 127 years, the once-modern refracting telescope at Ladd Observatory maneuvers via its original counterweight-driven gear drive to reveal the wonders of the night sky. 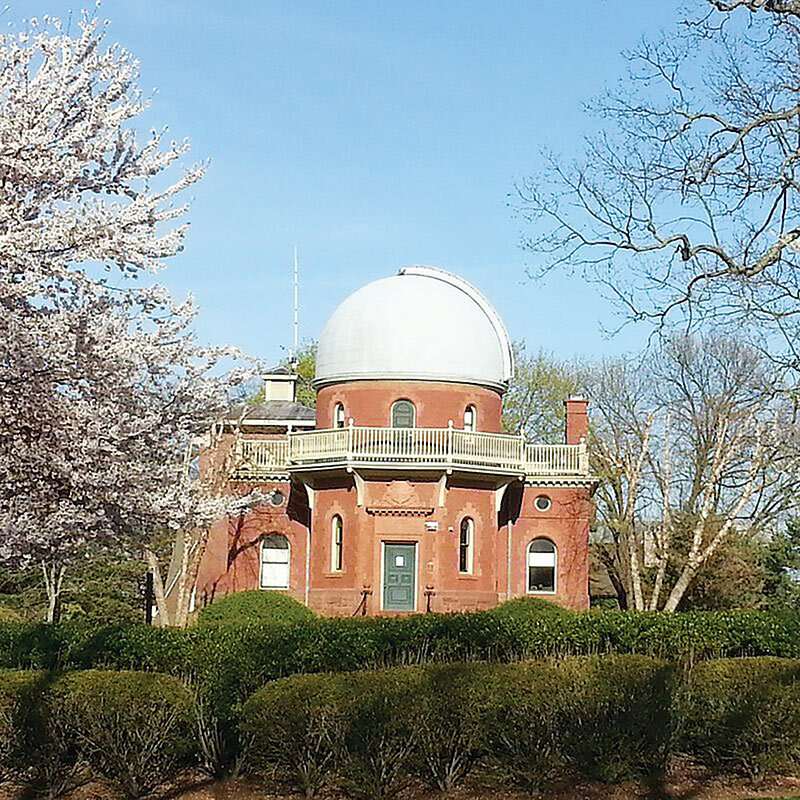 This makes Ladd one of the few 19th-century observatories with its main telescope still in original condition, says Brown University physics professor Ian Dell’antonio. The telescope, with a 12-inch aperture and 15-foot focal length, provides visitors with a unique perspective of space and the passage of time. “If it’s clear, the optics of the telescope permit great views of the moon and planets. The sky is a little bright—Ladd used to be alone on top of the hill, but in the last 100 years Providence has engulfed it,” says Dell’antonio. In its early days the observatory marked time in another important way. From 1893 to 1916, Ladd kept time using stellar observations and sent out a time signal to the city of Providence. Although radio signals from the US Naval Observatory usurped this role in 1916, Ladd sent time signals to local fire and police departments through the early 1970s. The observatory now has a unique collection of historical clocks, regulators, and other instruments. Today, Ladd is primarily used by Brown University students studying the history of astronomy and celestial navigation, and for public observing events. In addition to the refracting telescope in the main tower, there is a transit room with two transit telescopes and a pier that holds a modern 10-inch reflecting telescope, weather station, and an all-sky camera. “The ocean is a defining feature of our planet, and crucial to life on Earth, yet it remains one of the planet’s last unexplored frontiers,” begins the vision statement of the Woods Hole Oceanographic Institution (WHOI), a large independent research facility located in Woods Hole, Massachusetts, the site of a protected deepwater harbor. WHOI researchers are at the forefront of this exploration—studying the physics, chemistry, biology, and geology of the ocean and its role in climate change. They work on land and at sea, observing, documenting, and modeling aspects of the ocean and its connection to the earth. Many are physicists that apply their knowledge to studying ocean processes and designing instruments and robots that can withstand the extreme conditions found in the depths of the ocean. 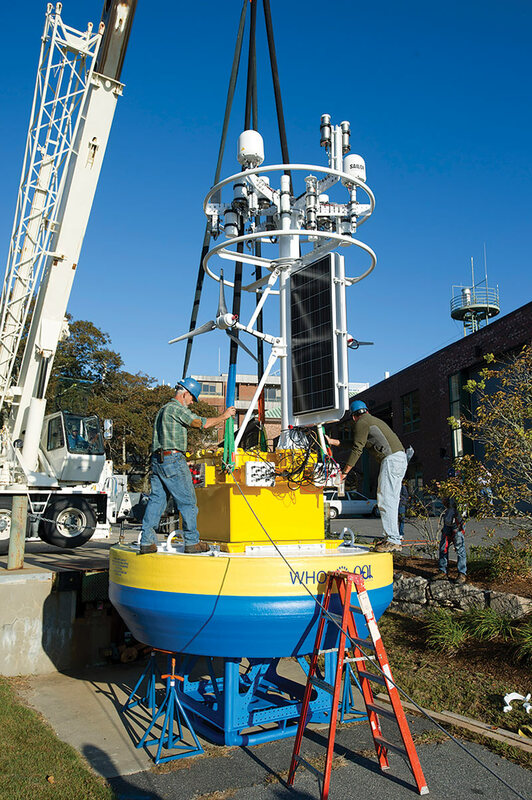 Along with lab spaces, WHOI operates two large research vessels and several smaller watercraft and autonomous vehicles based at the harbor. Atlantis and Neil Armstrong, the large vessels, have permanent crews that take groups of scientists out to sea to collect samples, deploy instruments, or carry out other research activities. One of the key features of the institution is that scientists have the freedom to set the course for their own research, according to senior scientist Larry Pratt. “It’s very different from a corporate environment, with an immediate boss and set daily hours,” he says. Some researchers are seagoing, and others work on water tank experiments, design instruments, or develop computer simulations. Some are even engaged in debris location efforts—WHOI scientists helped discover the Titanic and a large portion of the wreckage from Air France Flight 447. The Naval Submarine Base New London is home port to 15 US Navy attack submarines—stealth operators designed to locate and destroy enemy submarines and ships, conduct surveillance, carry special operation forces, and engage in other warfare activities. The submarines are fantastic feats of physics and engineering. Powered by nuclear energy, they utilize some of the most advanced data-gathering and weapons technologies in the world—even while operating more than 800 feet below the surface. In the newest submarines, traditional periscopes are replaced by photonics masts with visible and infrared digital cameras on telescoping arms. 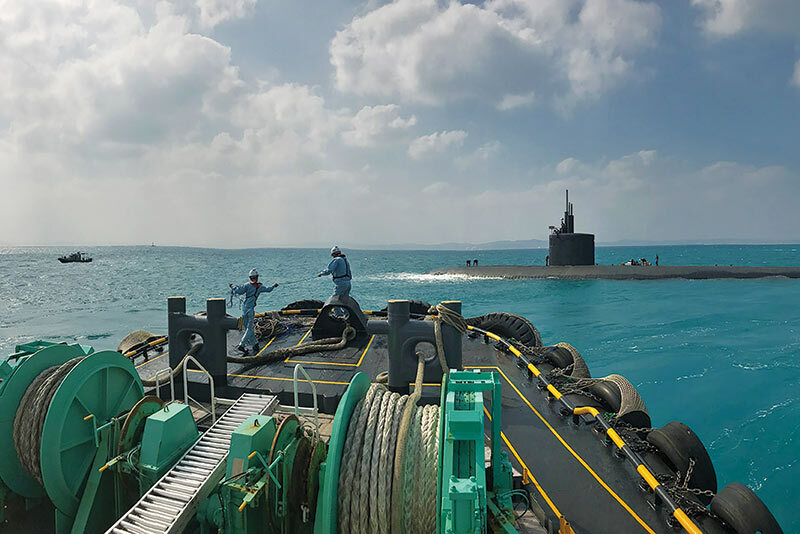 The base also houses the primary training grounds for submariners, including facilities for fire management and a 40-foot-high pool for deepwater escape training. 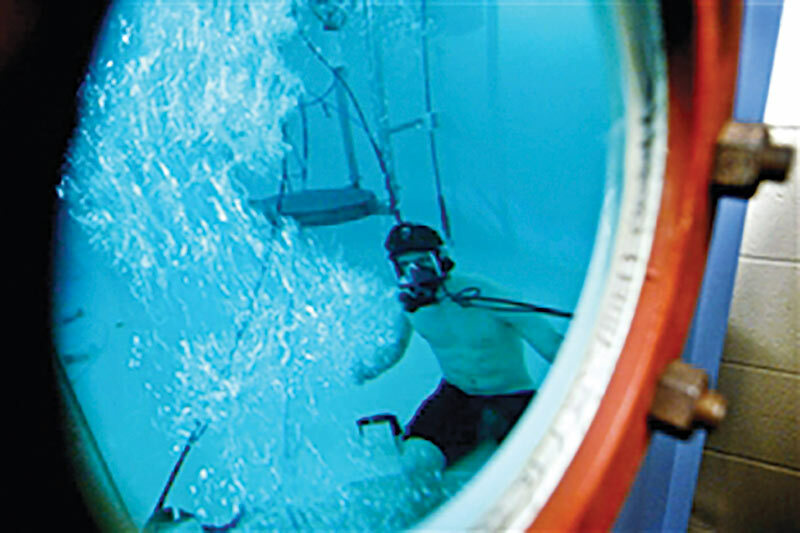 A medical research lab on campus studies how the undersea experience impacts humans. The USS Nautilus, the first nuclear-powered submarine, is moored near the main gate of the adjacent Submarine Force Library and Museum. Nautilus launched from the base in 1954 and is now a National Historic Landmark. The base also neighbors the General Dynamics Electric Boat’s main construction yard where most of the US Navy submarines are built.